When AudioSource brought in their new AD2002 power amplifier for us to listen to, I was really impressed. When AudioSource brought in their new AD2002 power amplifier for us to listen to, I was really impressed. This compact workhorse is absolutely packed with features. It combines robust amplification with useful customization and control options — all while maintaining a small footprint. The versatile '2002 delivers high-quality playback for both analog sources like a tuner or turntable, and digital sources like a TV or CD player. I really like this amp for folks that want an easy two-zone music system. Use it to drive your favorite tower or bookshelf speakers in your living room, while also playing music through a pair of outdoor speakers at the same time. The AD2002 is a great amp for setting up a two-zone music system. It can drive two separate pairs of speakers connected to its A and B binding posts. Because it's four-ohm stable, you can enjoy music through two pairs of eight-ohm speakers simultaneously. Play music indoors through the A pair of speakers, and listen to the same source outside through the B speakers. When it's time to come inside for the night, simply switch off the B pair and let the party continue inside. The included remote provides easy control. 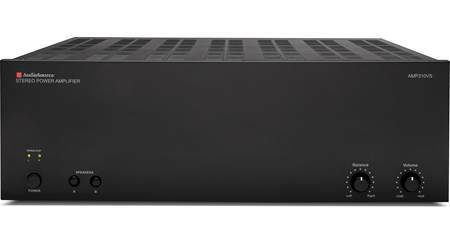 At its heart, the AD2002 is an old-school power amplifier with 100 watts of continuous power per channel when connected to a pair of eight-ohm speakers. It also cranks out 225 watts at four ohms. Want to bridge the channels and use it as a mono amp for a single speaker? You'll get a whopping 450 watts of clean power from this amp. Use multiple AD2002s for a cost- and space-efficient way to get separate amplification for each channel of your home theater or two-channel system. The AD2002 offers two pairs of analog RCA inputs for your music sources. It also offers an optical digital input, which provides a high-quality connection for a TV, CD player, or network music streamer. The amp can switch sources automatically when a signal is detected. It can be turned on manually, or automatically when it detects a source. It is also 12-volt trigger compatible so you can have it turn on when another piece of equipment is fired up. Rear-mounted bass and treble controls provide tone adjustment for your room. One of the features I like the most about the AD2002 is the ability to set maximum volume limits. On the upper left corner of the back panel are two small dials. These let you set a volume "ceiling" for each channel, so even if some over-enthusiastic listener maxes out the volume knob on the front of the amp, there won't be any damage to the speakers. This is a great way to make sure that guests or kids don't accidentally turn the system up to distortion levels. Very easy set up. Works great with my Sonos component. Great unit. Can the optical input act as the interrupting input? Sorry, I don't have the great expertise that Crutch has. I've called them a few time with technical questions and they're pretty much up on everything. Have a Great Holiday season. 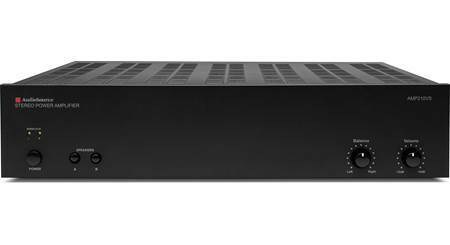 AudioSource AD Series: AudioSource AD series amplifiers are designed for home and commercial audio distribution systems where high quality sound, flexibility, and reliability are essential. The AD series offers exceptional value and many features that will make their installation and use easy and convenient. 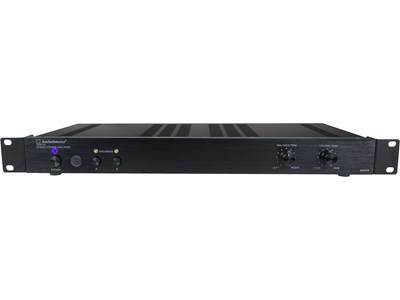 Digital Stereo Power Amplifier: The AudioSource AD2002 digital stereo power amplifier is designed for dedicated stereo & distributed audio applications. It offers A & B speaker outputs. The amplifier can be configured for Stereo or Bridged output. Main Input/Output: The AD2002 Main Input consists of stereo RCA jacks and are used as the amplifier's primary audio inputs. The Main Output also consists of stereo RCA jacks and passthrough the AD2002's Main Input audio signal to another amplifier. 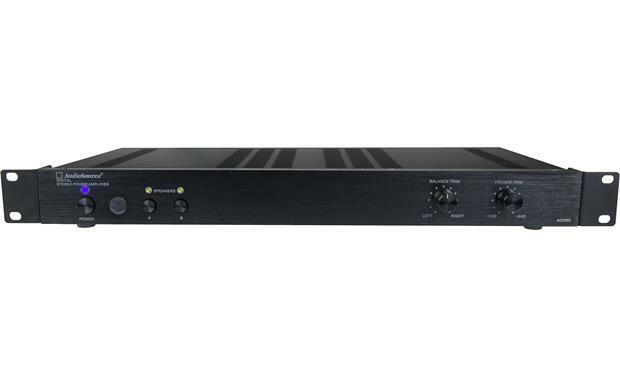 Optical Digital Input: The amplifier features an optical (toslink) digital input that will accept 2ch PCM audio signals (not compatible with Dolby Digital/DTS). Speaker A/B Terminals: The AudioSource AD2002 is fitted with binding-post terminals for A & B speaker connection for powering up to two pair of speakers. The minimum impedance for each speaker section is 4-ohm in Stereo mode and 8-ohm in Bridged mode. The binding post terminals will accept bare wire (up to 10AWG), pin-connectors, and banana plugs (single only). High-Level Inputs: The screw-down high-level inputs can be used to connect a source with speaker-level output instead of line-level outputs. Route this high-level input signal to either the amplifier's Interrupt Input or Main Input. Trigger In/Out: The 12V trigger input and output allow the AD2002 to be powered on by other electronics or to power on other electronics via a 3.5mm minijack cable. The trigger input can operate with voltages between 3 and 20VDC. 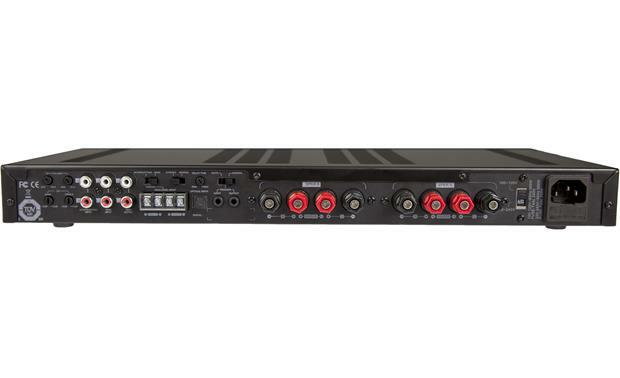 Power Cord: The digital stereo power amplifier features a detachable 6' AC power cord terminated by a 3-prong connector. Front-Panel Controls: The AudioSource AD2002 digital stereo power amplifier features the following front-panel controls. Power Switch: The front-panel Power Switch turns the AD2002 on or off. A red LED indicates connection to AC power while in standby mode and turns green indicating audio signal is present. Volume Trim: This rotary encoder adjust amplifier volume from -12dB to +6dB relative to the the Master Volume control the back panel. Rear-Panel Controls: The AudioSource AD2002 offers the following rear-panel controls. Master Volume: Provides independent volume level adjustment of the amplifier's left and right channels. Mode Select (Stereo or Bridged): Select Stereo mode for connecting one or two pair of loudspeakers, When set to Bridged mode, the AD2002 becomes a single channel mono amplifier for powering one speaker. Only the Right audio input is used during bridged-mode. Only one zone (A or B) can be bridged; not both. Delay Time: Allows for a 3 to 15 second delay to be set when switching from the amplifier's Interrupting and Main Input. Power Mode: Set the Auto On switch to Normal for manual power on/off. Set the Auto switch to Auto for signal sensing; the amp will turn on when audio signal (>5mV) is detected at the inputs The front-panel power switch must be in the On position (pushed in) for the Auto On feature to operate. Or, select 12V Trigger which allows the AD2002 to be powered on by other electronic component or to power on other electronics via a 3.5 minijack cable (between 3-20VDC). Remote Control: The AudioSource AD2002 includes an IR remote control for wireless operation of the amplifier. Remote control functions include Power/Standby, Volume Up/Down, Mute, and Speakers A/B. Mounting Options: The AudioSource AD2002 digital stereo power amplifier features four rubber feet and can simply be placed on top of a flat surface; like a table-top, shelf, or stand. 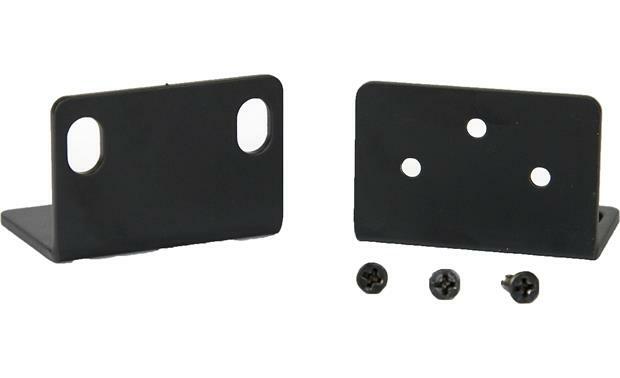 You can also remove the four rubber feet and rack-mount the amplifier using the included rack-mount ears and screws. I'm not sure Jason. That would be a question for Audiosource or Crutchfield. I'm not sure. I'm not using opycal connections on my two amps. I'd call Crutchfield and ask their tech support people. They've always been good to me on issues like that. What is the rated output into 6 ohms? To be honest Russ, this would be a question better answered by the tech guys at Cruthchfield. I can tell you that the amp is a nice piece! Not sure. but it seems I saw it once in the downloaded PDF file of the owner's manual. If using digital audio input, does audio output to another amp still work? Sorry, I have yet to install my amp so I can not answer your question. Sorry about that!! I can't say for sure, but I believe it does. I had to return mine, because I couldn't transfer digital audio to another room. However that problem had to do with the tuner-reciever's ability to transmit digital through the B-channel. Research your tuner-receiver's specs before you assume it will. I was surprised to learn my expensive Sony tuner did not transmit digital audio through to other room set-up..
Searches related to the AudioSource AD2002 Digital stereo multi-source power amplifier, 100 watts x 2.